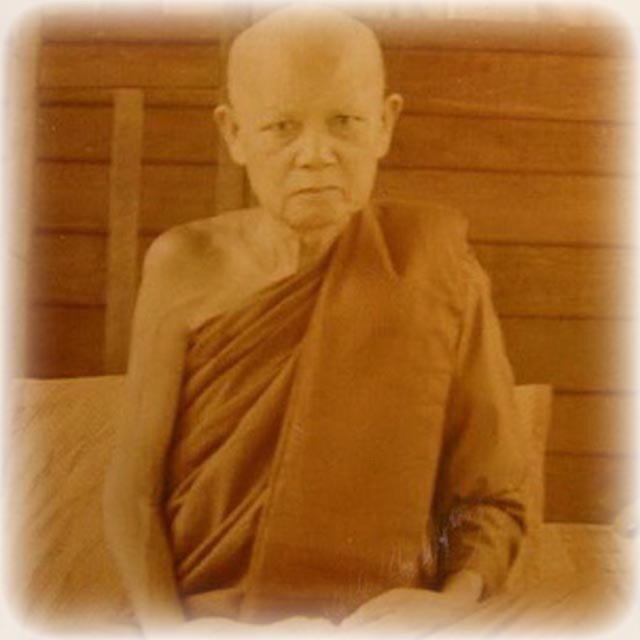 Luang Por Phang Jidtakudto, of Wat Udom Kongka Kirikhaet, in Udorn Rachathani, was born under the name of ‘Phang Krong Yudti’ on Tuesday 2445 BE in Ban Gudtakasian, in Tambon Khuean, Amper Khuang Nai in Ubon Rachathani. He had two siblings. The young Phang was Ordained into the Sangha at the age of 20 years old in 2465 into the Maha Nikaya sect, and Wat Khueang Klang, Ubon Rachathani. 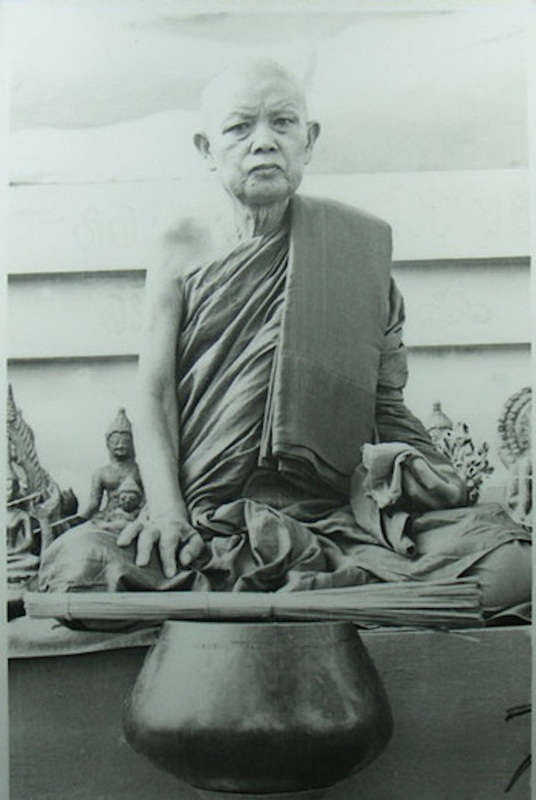 His Upachaya was Pra Kroo Luang Por Duan, Pra Ajarn dee was his Gammawājājarn. After his Ordination, Luang Por Phang then studied Dhamma Vinaya with Luang Por Somkuan, . After one year of Ordination, Luang Por Disrobed, and at the age of 23, he married with Miss Jan dee Say Sema, a girl from Ban Daeng Mor, Ubon Rachathani. They remained married for a period of 23 Years, but never had any children, except for taking care of an orphan whose parents had passed away. As Luang Por Phang reached the age of 43, both Luang Por Phang, and his Wife, ordained, Luang Por Phang becoming a Bhikkhu, and his wife went to Ordain as a Buddhist Nun (Mae Chee). They gave all of their possessions to their adopted child Miss Noo Pan, who was married with family already. Luang Por Phang was reordained back into the Maha Nikaya lineage sect, this time at Wat Koo Khad, in Ban Sri Sukh township, in Ubon Rachathani. This time Pra Kroo Sri Sydtaporn (Luang Por Dter) was his Upachaya. His Pra Gammawājājarn’s name is undocumented. Luang Por stayed officially at Wat Koo Khad, but in fact also learned to practice Kammathāna Vipassana at Wat Pha Warin Chamrab, with Pra Ajarn Singh and Pra Ajarn Maha Bpin. 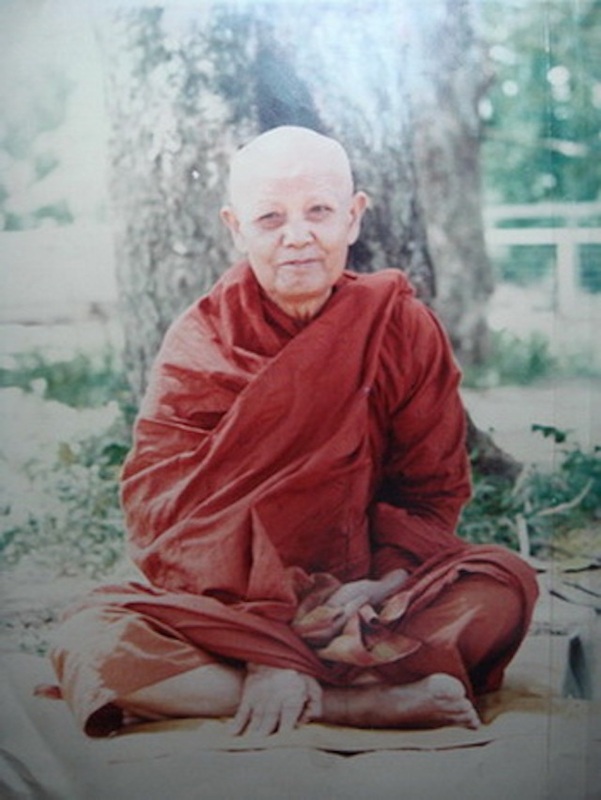 When Luang Por Phang reached the age of 47 however, he changed sect lineages to enter into the Tammayut Forest Monk Lineage and was Ordained as a Tammayut Monk at Wat Ban None (also known as Wat Tung) with Pra Maha Orn as his Upachaya and Pra Maha Sai as his Pra Gammawājājārn, and Pra Maha Luang Por Jantr as his Pra Anusāwanājārn. His Ordination as a Tammayut Monk took place on Wednesday the 23rd of May 2491 BE, marking his third and final Ordination. Luang Por Phang then continued to practice the Kamathāna Vipassana method with Pra Ajarn Singh, for some years, and finally set out in solitary to practice Tudong (Tudhanka) Forest wandering on his own, to develop in his skills and powers. wanderings, he came to stay at Wat Pha Ballanksilatip in Ban Taen, Khon Kaen, and stopped to stay there for one year. Once the rainy season retreat was over, Luang Por Phang then wandered out again and came past the municipality of Manja Kiri in Ban Soke Nam Khun. The local devotees of the area saw Luang Por Phang was staying in the forest, and beseeched him to stay for a while, asking him to stay and practice at the foot of the Pu Pa Daeng mountain. This place was considered very sacred to the local folk, and there was a water spring where water flowed out all the year round. Luang Por Phang saw the place, and was astounded to see that it was the place he had been having visions of in meditation for many years already, and so decided it was destined for him to stay there. Until Luang Por Phang’s appearance, no monk had ever been able to stay iin this place, for its powerful local spirits and magic present, but Luang Por Phang was able to remain there quite easily. Luang Por Phang then invited the local devotees to help him to build a temple there. The locals of this area used to call this sacred mountain water source ‘Doon’, and so in those days as the temple was rising up into existence, they called it ‘Wat Doon. Luang Por Phang stayed on building the temple of Wat Doon, occasionally traveling out into the forest on Tudong, and had various miraculous adventures during those journeys he made in solitary into the deep forests, and mastered his Wicha. He remained faithful to the simple ways of a Bhikkhu and endured the hardships of a Tudong Monk, and was thus a well attained ‘Pra Subattibanno’ (Good Bhikkhu of High Endurance, Renunciation and Purity). The temple of Wat Doon was given the official name as we know it today of Wat Udom Kongka Kirikhaet. Another great Meritorious deed of Luang Por Phang, was that he built a road (widening of the road) which was too thin and impossible for the local farmers and other traffic to navigate along without difficulty, withough any need of government funding, and presided over the whole construction process, to lessen the problems of locals of the area, and solve the problem of lack of funds of the local provincial government. Luang Por Phang also pestered the local Government in the department of public highways to build another road widening and lengthening to bring devotees to the temple (for there was no real road to speak of for devotees to come to the temple), which took him constant efforts writing to the government offices, between the years 2507 BE, and 2523 BE. Finally, the Government assisted to build the road in the year 2523 BE, after his letters to them and requests were finally heard. His patience and persistence won out in the end, to give the locals a road to be able to use for their needs, and to reach the temple without having to cross wild territory. In the year 2523 BE, Luang Por Phang sponsored the building of the Pratat Kham Kaen Sirodom Relic Stupa Shrine which stands before the Central Municipal Building of Khon Kaen City, with the assistance and donations of the local devotees, to celebrate two hundred years of the Ratanakosin Era. On the 31st march 2525, Somdej Pra Sangkarach Sakol Maha Sangka Barinayok (Somdej Prayan Sangworn Pra Sangkaracha Royal Head Monk, came to perform the Inauguration of the Pratat relic Shrine for the Local Buddhist Folk to be able to perform Bucha and Revere the shrine. On the 28th of November, Luang Por Phang was admitted to Hospital and was found to have Cancer of the Gall Bladder. On the 23rd of February 2525, Luang Por was readmitted to the Paet Banya hospital because he felt rather weak, and was suffering internal bleeding, and his heart muscles were having problems pumping his heart. On 16th March 2525 Luang Por felt a bit better, and the Comittee of Devotees of Luang Por Phang came to take Luang Por Phang back to the temple, but after a few days of having returned to his temple, he felt ill again, and was unable to eat or drink, or pass water. Then, on the 24th of March 2525, at 16:45 PM, Luang Por Phang finally passed away peacefully, at the age of 80 years Old, which was a very sad occasion for the devotees of this highly beloved Monk, who never sought recognition and always worked hard for the welfare of the devotees and his temple, and to spread the Buddha Dhamma. He was known for having always said “I don’t want my name to be known famously’ ‘I don’t want to receive honors or status’ ‘I don’t wish people to speak highly of me’ – But these wishes seem to have been in vain, for indeed, Luang Por Phang, is one of the most highly revered Monks of Udorn Rachathani, and his Goodness and Generosity, and Tireless Work to help his People, is Legendary, even now long after his passing. Satu! May Luang Por Phang and his great Merits, remain in our memory forever, and may his great blessings remain with us, through the Buddhanussati of keeping his memory and reverence to Luang Por Phang in our hearts, with the amulets in his image which we wear and revere, in ‘Putta Bucha’!